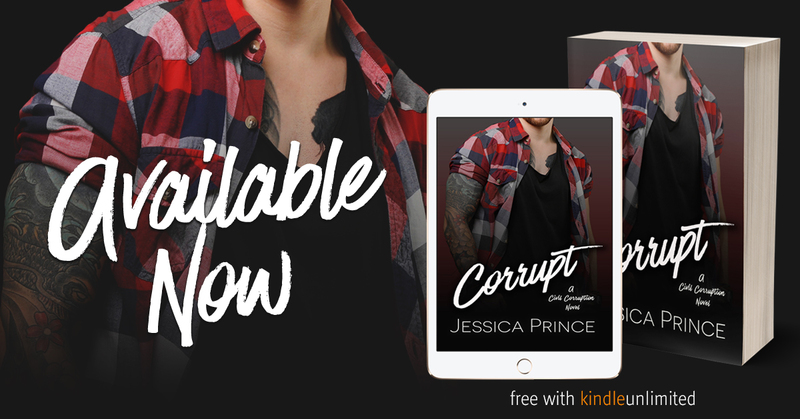 I loved Corrupt by Jessica Prince, her first book in her new series, Civil Corruption! I consumed this book in one sitting and then read it again shortly after. This is Garret Wilder’s story, the drummer for Civil Corruption, the hottest band in the country. I will tell you upfront I love bad boy jerks. Not sure why, but I do. I love to see them be reformed by the love of a good woman. So honestly, I had such a love-hate relationship with Garrett. When he meets Gwen Carson he seems like a good guy meeting a girl at a party. They hit it off and spend an unforgettable night together. The next morning Gwen realizes who he really is and how much of a bad boy he is. But somehow, he ends up beings a permanent fixture in her life. Like it or not and though she wants to punch him almost every time she must deal with him! But no matter how much she tries to hate him, she is also drawn to him. Garret was such a jerk at the beginning. He was your typical rocker! Rich, spoiled and a partier that went from one woman to the next. I wanted to strangle him. Then we begin to see a different side of him. A more serious side that wanted to get to know Gwen and spend time with her. That Garret stole my heart. He was sweet, caring and so much the possessive alpha. He was also funny and witty. Gwen was so sad at the start of the story. After suffering such devastating losses, she wanted a fresh start and moved to Seattle to be with her best friend. One night changed her life forever and though she was drowning in grief, she was strong, willful, feisty and so loving. She stood her ground and never let Garret intimidate her.